Let’s hear from David in his own words, shall we? 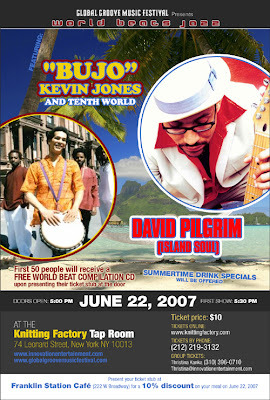 Friday JUNE 22 brings me back full-tilt, full band to THE KNITTING FACTORY as part of the GLOBAL GROOVE MUSIC FESTIVAL. It will be a wide ranging night of music from world music to rock. Get in where you fit in, people!! DIRECTIONS: 1 or 9 train to Franklin Street, walk one block south to Leonard, A, C or E train to Canal Street, walk 4 blocks south and turn left on Leonard. N or R train to Canal Street, walk down Broadway to Leonard. BEHIND EVERY GOOD MAN: Got a sweet little acoustic gig coming up at the ROCKWOOD MUSIC HALL, a quiet cozy venue especially receptive to the songwriter on MONDAY JULY 9TH. I have asked a few of my female friends to accompany/blow me away on this one. On percussion and steel pan will be my longtime friend and co-conspirator LESLIE WARD. If you heard pan on ISLAND SOUL, she was the culprit. I?ve asked a few other friends to help me, but they shall remain secret until the next bulletin. Start feeding that anticipation, folks! PUBLIC DISPLAY: It?s official! I?ll accompany my bredren COLIN CHANNER for the reading of his piece HOW TO BEAT A CHILD THE RIGHT AND PROPER WAY at JOE?S PUB, THURSDAY JULY 26th!